GW may be asking for contributions to its $1 billion fundraising campaign, but there’s one department looking for donors to give the ultimate gift: their bodies. The University’s body donor program helps first-year medical students learn anatomy beyond what a textbook can teach, becoming part of a student’s “rite of passage” at the school. 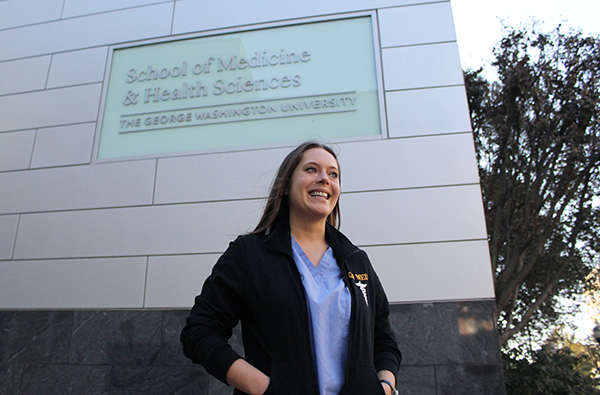 And though GW is an outlier among medical schools nationwide, many of which do not have students work with donated cadavers, the number of body donors has increased 80 percent over the past two years. About 800 more people have signed up to give their bodies to the University over the past two years, which makes the total number of donors on the list top 1,800. Anne Banner, the director of communications at the School of Medicine and Health Sciences, said there is no active recruitment for body donors and most people sign up for the program because they are aware of the need for cadavers for teaching. The Body Donor Program, which resides in the department of anatomy and regenerative biology at SMHS, helps GW stand out from other medical schools: It is one of 130 schools in the country with a body donation program, but does not accept bodies from other sources, such as morgues. If donors’ bodies do not reach the school’s standards, they are declined. Bodies are only accepted if the person has died within a 50-mile radius of the program. Other factors, including diagnoses of communicable diseases like HIV or AIDS, any recent surgery or obesity, can lead to bodies not being included. While many people donate their organs, less than 1 percent of the general population donate their bodies to science. Other medical schools will sometimes use unclaimed or unidentified bodies from local morgues, but D.C. has no official system to allow those bodies to be used for medical studies, Krum said. Professors and medical students say the program helps them better prepare to work in a hospital setting. Even though GW offers its students opportunities to learn with virtual tools or dummies, like in its simulation center that expanded earlier this year, there is still a heavy emphasis on practicing with cadavers to gain a realistic understanding of the human body. Anne Hirshfield, a professor of anatomy, also said dissection of actual human bodies is a crucial part of the learning experience for medical students. Body donor programs can be found at other universities across the country as well, including Vanderbilt and Stanford universities. Unlike most other university donor programs, including GW, UCLA does accept people who have been organ donors. Fisher added that the program tries to spread awareness through word of mouth, visiting hospice meetings and nursing homes. GW cremates the bodies once studies are completed, typically 24 to 36 months from the time of death, and returns the ashes to the donor’s family. In the spring, a special memorial service is held for the families of body donors to show gratitude and celebrate the lives of the donors. Kurt Johnson, a professor in the anatomy department since 1977, said he plans to donate his own body to science, but not to GW.